Jean-Michel Basquiat's art was as unique as it was extraordinary - forming a rare bond between street art and the institutions of the international art world. Basquiat was categorised within the Neo-Expressionism art movement, an umbrella capturing all manner of contemporary artists. This young American cited Pop Art and Expressionism as his main influences, with Andy Warhol a personal friend. 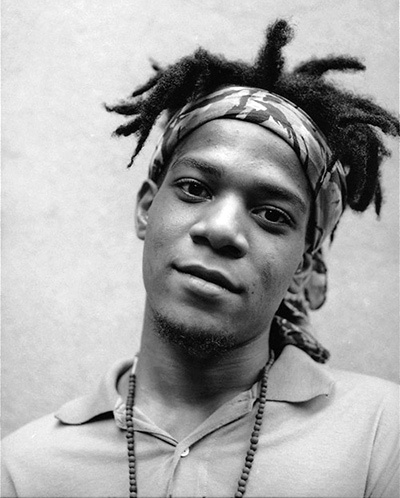 Basquiat was also politically motivated and wanted to make use of his rare priviledge of being a successful Afro-Caribbean artist whose voice would be heard. Those viewing his style for the first time would instantly draw comparisons with some of the more abstract work of Paul Klee and Pablo Picasso. The use of symbolism with graffiti art is particularly in vogue in the present day, thanks to the popularity and high profile status of UK artist, Banksy. Basquiat's rejection of the mainstream fitted perfectly with in the Punk scene of New York. The style of art used there was also wildly expressive and abstract. To the casual observer Basquiat's style was manic and approximate, suggesting at form through expression. It reminds us of Jackson Pollock and his drip technique. In fact, this was an artist who carefully drew together all manner of items into his symbolic artwork. Manic was not the state of his mind as he put together these busy compositions - despite how the final paintings may have looked. Basquiat's work can be described as collage work, combining his urban and Afro-Caribbean influences. For him to succeed in the white-dominated art world shows ingenuity and a strength of character. His roots, being so far from the white middle-class heritage of most international artists, ensured that his personality could transcend more areas of society. He was also able to establish himself as a celebrity as was seen with the likes of Andy Warhol and socialite Tamara de Lempicka. Basquiat was a creative talent, always looking for new avenues in which to take his ideas and passion. Prior to establishing himself as a renowned mainstream painter, Jean-Michel was a poet, musician and graffiti artist around the streets of New York. He also took some inspiration for his collages from prominent artist Robert Rauschenberg, who was establishing his own reputation around the same time. This vibrant, eclectic city was the ideal breeding ground for the artist's talents. New York had been at the forefront of contemporary art ever since the end of WW2 and was more open to new artistic movements than European cities. The rise and fall of Basquiat during the 80s underlines the commercial exaggerations experienced by successful artists at that time. Hype and publicity boosted and destroyed many a career at this time. Only those who remain popular today had the talent to back it up.